On his way back home, Ramba met a beautiful female demon, who was in the form of a buffalo. He fell in love with her and decided to take her home. At midnight while Ramba was making love with the demoness, another wild male buffalo attacked and killed him. The grief-stricken she-buffalo also gave up her life by jumping into the funeral pyre of Ramba. But Agni's boon had to come true. Therefore a baby boy was born from the funeral fire. The boy was later named Mahishasura, the buffalo demon. All the gods, headed by Lord Brahma, came over to Kailasha (a peak in the Himalayas ), where Lord Vishnu and Lord Shiva were busy in divine conversations. 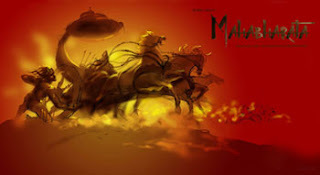 They narrated the whole story of how the demon-king Mahishasura dethroned Indra from the heaven. 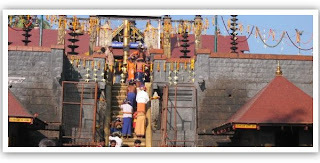 They added that, the demon is severely putting an end to the devotees of Vishnu and Shiva, by killing them cruelly. The Asura (demon) wants all in the universe to worship him as god, and not anyone else. 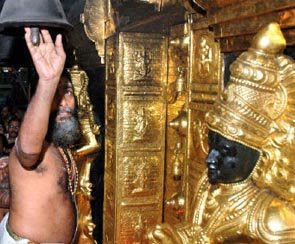 First, There's no yajna (worship through divine fire in the altar) for long, and the gods of heaven are leading a life in disguise in the mountain caves, away from the clasp of Mahishasura. Hearing the story, the faces of Vishnu and Shiva turned red in wrath. Their faces glowed up. A sudden effulgent, fiery glow came out of their faces, and at a single point, the energy, the 'jyoti' (divine glow and aura), of all the gods coalesced and formed a gigantic mountain of fire. Soon, this 'jyotipunjah' (heap of 'jyoti') took the form of a young woman. She had the complexion of molten gold, and her 'jyoti' touched the heavens high above. Her face was from the light of Shiva. 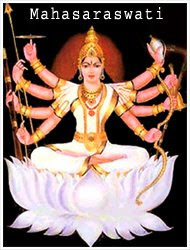 Her ten arms were from Lord Vishnu. Her legs were from Lord Brahma. Where as, her hair from Yama, her hips from the force of the goddess Earth, her breasts from the Moon-god, and so on. 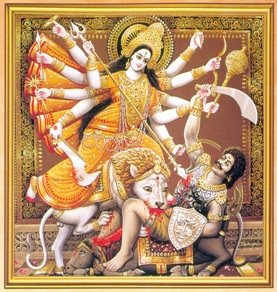 The dispossessed gods were drawn to Durga. They praised her and gave to her their divine gifts: Pinakadhrik (Shiva) gave her a trident - "Trishula". Lord Vishnu gave her a disc - "Chakra". 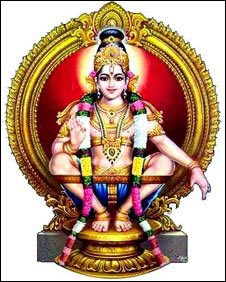 Varuna, the god of water, gave her a conch - "Shankha", and the god of fire gave her a missile. From the wind, Vayu, she received arrows. The king of gods, Indra, gave her a thunder-bolt, and the gift of Indra's white-skinned elephant Airavata was a bell, or "ghanta". From Yama, the god of death, Durga received a rod - "Kaaldanda", and from the Ruler of Waters she was given a noose - "Paash". Durga received many other precious and magical treasures -- gifts of jewels, new clothing, and a garland of immortal lotuses for her head and breasts. Heaven's architect Vishwakarma gave her a bright axe and magic armor. God of the Himalayas , Himavat, gave her jewels and a magnificent lion to ride into battle as her mount ("vahan"). Now equipped with the fearsome weaponry of the gods and dressed in golden armor and jewels she set off, seated gracefully upon that lion. His thunderous roars shook the three worlds. Oceans boiled and surf poured overland. Continents were torn at their granite foundations as whole new chains of mountains rose, while older ranges crumbled, cracked, and gave way to dust in a thousand landslides. Seeing these cataclysms rippling in waves through all the three worlds, Mahishasura and his demon allies found their attention drawn from heaven to Earth. Though confident of their power and control in heaven, even the conquering demon host could not help being awestruck. The demons had little time to admire the radiant visage of their new adversary, for soon she engaged them on the battlefield. First the army of Chikasura and then that of Chamara, Mahishasura's chief commanders were met. They were destroyed in a great battle. At first, confident of his overwhelming power, Mahishasura held in reserve his personal demon army. But seeing the setbacks being dealt his commander's troops on every side, it soon became obvious to Mahishasura that even his personal guard must be completely committed or he would surely be cast out of heaven. Or worse. Onto the battlefield swarmed that most elite and despised assemblage, with its gruesome hordes of infantry gleefully wielding their unearthly collection of dark iron axes and halberds, gorey bludgeoneers side by side with squadrons of demon-archers. Leading this evil array in its mad and desperate charge were thousands of charioteers and cavalry of horses and elephants. Surrounded by chants of praise, the blowing of horns the beating of drums and songs of worship Durga roamed the battlefield on her mighty lion. From her divine breath her army was constantly replenished with new warriors, each able, brave and resolute. With her bell she confused the demons, and many were dragged away bound and chained. With her divine sword she cut them to bits. So many demons and elephants and horses died that a river of blood flowed across the battlefield. The ground was left littered with the broken limbs and body parts of the defeated demon army. 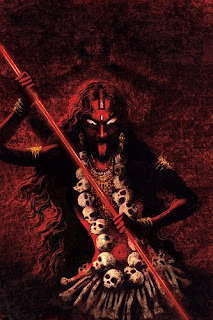 Durga was then attacked by the demon commanders, who were all killed immediately, and without mercy. Mahisha, the king of the demons and usurper of the throne of heaven, was shocked and enraged by the disastrous events on the battlefield. He reverted to his own form, a buffalo, and charged about on the battlefield. He ran wildly at Durga's divine soldiers goring many, biting others and all the while thrashing with his long, whip-like tail. 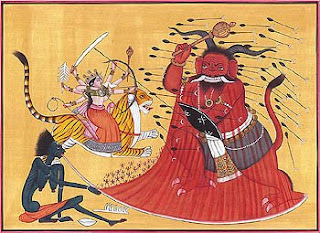 Durga's lion, angered by the presence of the demon-buffalo, attacked him. While he was thus engaged, Durga threw her noose around his neck. To escape this trap, Mahishasura discarded the buffalo and assumed the form of a lion. Durga beheaded the lion, and the demon escaped in the form of a man. Without hesitation, Durga dispatched the man with a flight of sharp arrows. Mahishasura and Lion Yet again the demon escaped, and this time took the formidable shape of a huge elephant, which battered Durga's lion with a tusk. With her sword Durga hacked at the tusk until it too was broken. Weakened, the demon reverted once more to his own form the wild buffalo. He retreated into the mountains where he hurled boulders at Durga with his horns. The Mother of the Universe drank the divine wine, gift of Kuvera. Mayaa twayi hatehtraiva, garjishyantyashu devatah "
--- Take thou time to squall and scream as long as I don't finish up my divine wine, o, foolish Mahishasura! I will soon slain you (after I finish my drink), and the gods of heaven would burst in the joy of victory. Immediately after this, the goddess jumped onto Mahishasura, pushing him to the ground with her left leg. She grasped his head in one hand, pierced him with her sharp spear held in another, and with yet another of her ten hands she wielded her bright sword, beheading him. At last he fell dead, and the scattered surviving remnants of his once invincible army fled in terror. The gods returned to heaven, and along with the sages of the earth, they sang praises to the Goddess Durga. Henceforth, and to this day, the Goddess Durga is worshipped by all the gods in heaven, and all human beings on earth. As he requested, Mahishasura is there too--frozen in his moment of final defeat, impaled by Durga's spear and prostrate beneath her left foot. After Mahishasura, two more demon brothers, Shumbha and Nishumbha started troubling the asuras. They forcibly snatched off the heaven from the Devas and pushed tem away. The devas then started praying to Mahamaya. At that moment, Parvati was going to have a bath in the river. She asked the Devas whom they were praying to. On listening to their tale of woe, from Parvati's body emerged a female form, Devi Kaushiki. 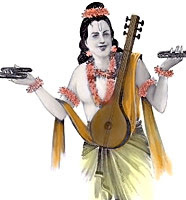 Upon the emergence of Kaushiki, Parvati's body turned black and she then became known as Kalika. Kaushiki was spotted by Chanda and Munda, Shumbha Nishumba's two assistants. They reported to their masters, that they had seen a beautiful woman. Shumbha then sent a messanger to Kaushiki. The messanger, Sugriva, went to Kaushiki and said My masters Shumbha and Nishumbha are the rulers of the heavens. They have sent me to you. They want you to marry either Sumbha or Nishumbha, the choice is yours. The Devi said I am foolish woman. I have made a very stupid promise that I will marry only that person who can defeat me in warfare. Tell your masters, whoever can defeat me in battle can win me. On hearing this, He calls another of his generals, Dhumralochana (Smoky-Eyes), and tells him to take sixty thousand of his forces, grab the woman by the hair and return her to him. Dhumralochana goes forth to Chandika and at first tries to persuade her to come peacefully to Sumbha. 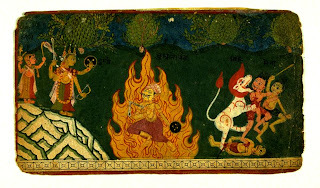 She is not so inclined, and when Dhumralochana attempts to attack her, Chandika turns him and his battalions to ashes. The asuras seeing the death of Chanda and Munda attacked the goddesses kaushiki and Kali from all sides. At that moment, from the bodies of the various devas, women forces began emerging. These devis started figting along the Kaushiki. 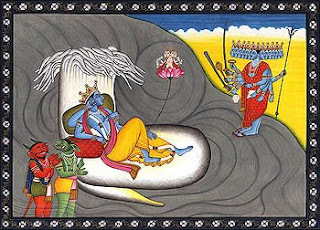 Kali then approached Shiva. She said, "You go to Shumbha Nishumbha as my messanger. Tell them to surrender." As Kali had told Shiva to go as her messanger, she became known as Shivaduti. Hearing Shiva's message, the asuras became ferocious. Among the asuras there was one named Raktabija. If a drop of his blood, spilt on the ground another asura would take birth from that. Unknowingly, the devis attacked Raktabeeja and from his flowing blood numerous Raktabeejas took birth. Seeing that Kali swallowed up Raktabeeja and the asuras born from the blood. Upon Raktabeeja's death, Nishumbha attacked. 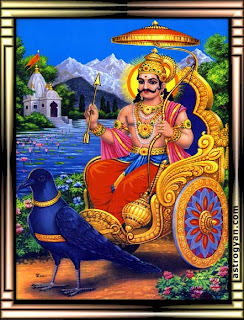 The devi then struck Nishumbha with a weapon called Khura, and Nishumbha became unconsious. Seeing Nishumbha fall, Shumha attacked. Shumbha also fell unconsious. 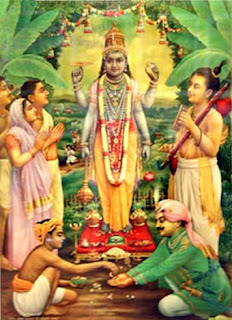 Upon regaining consciousness, Nishumbha attcked the devi but was killed. Kaushiki and Kali then killed off the complete asura army.